Following the release of his critically-acclaimed fourth studio album ‘Heaven Before All Hell Breaks Loose’ back in May, Plan B has unveiled a slick and cinematic new video for album track, ‘Wait So Long’. The official video to ‘Wait So Long, one of the album’s defining tracks, paints a bold new vision of the future as imagined by Plan B. 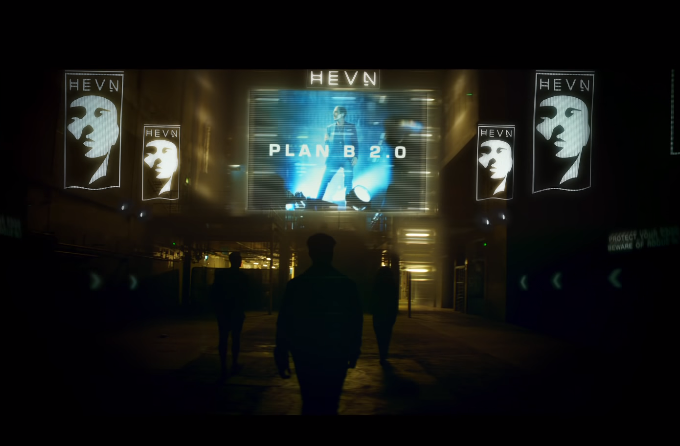 Set in the Neoverse – a virtual reality that the human race has become addicted to – it sheds more light on the world that Plan B’s ‘Guess Again’ video first started to explore. The ‘Wait So Long’ video subsequently follows the interactions between one human and a mysterious love interest, who go on to explore their own relationship amidst a performance of the track by digitally re-created entertainer, Plan B, who has been brought back from the dead to entertain the masses.. Entering the UK album chart at #5 in May, Plan B’s ‘Heaven Before All Hell Breaks Loose’ is a fiery riposte to the demands of the world we live in and the future we’re creating for ourselves. Bound together by the classic sci-fi imagery of world-renowned illustrator John Harris, the album released as his first full-length since 2012’s BRIT-nominated UK #1 album, ‘iLLManors’, which accompanied Plan B’s gritty, critically-acclaimed directorial debut of the same name.